Housed in what used to be the Kwangtung Provincial Bank, and in more recent years, a childcare centre for tots with CBD-toiling parents, the Lo & Behold group (also behind other establishments like Loof, The White Rabbit and Overeasy) have given their treatment to the distinctive Art Deco space on Cecil Street with the help of long-time design partner Takanouchi & Webb. The result is a handsome 130-seater ground floor dining room and showcase bar with the kitchen being run by culinary director Daniel Sia, who has updated the menu to feature more modern chophouse plates. 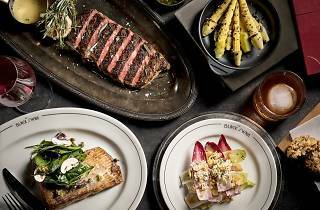 Think dishes like hand-chopped steak tartare ($26), Vidalia onion broth with bone marrow flan ($26), and The Black Swan Burger ($32). 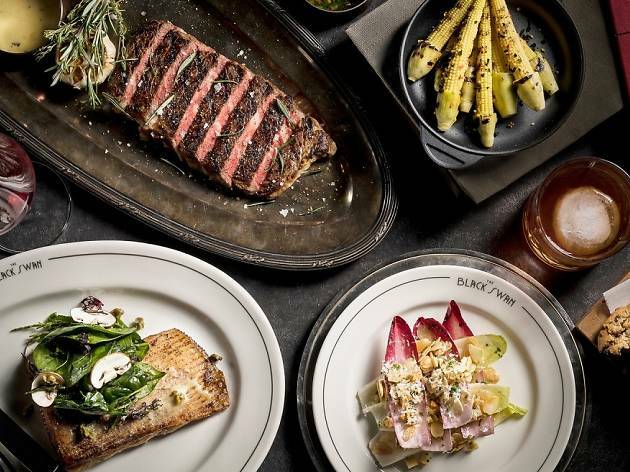 The steaks are sourced from boutique ranches around the world, so you'll find Brandt USDA choice tenderloin ($60) and Tajima wagyu striploin ($60) on the menu. Desserts are also a twist on steakhouse classics – don't miss the cookies and cream ($16) with milkshakes spiked with Baileys.